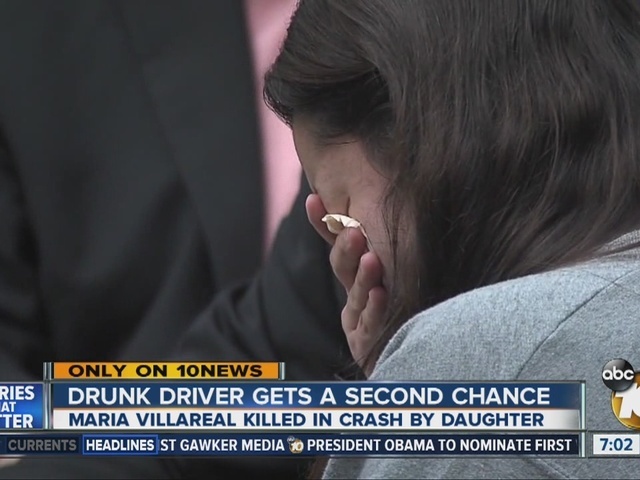 A woman who was driving drunk when her vehicle slammed into two parked cars and a dumpster in Clairemont, killing her mother, was sentenced Friday to one year in jail and ordered to enroll in a residential alcohol and drug treatment program once she's released from custody. Paulina Munoz, 27, pleaded guilty last month to gross vehicular manslaughter while intoxicated in the death of 50-year-old Maria Isabel Villareal. Deputy District Attorney Steve Schott argued for a four-year prison term. Prosecutors said Munoz spent most of the night of Sept. 25, 2015, drinking with her wife and her mother. Ignoring a text message not to drive, Munoz was behind the wheel when her car crashed at about 2:20 the next morning in the 3500 block of Clairemont Drive, not far from her home. "She was advised by her wife that she was intoxicated and should not be driving," said Schott. After the crash, Munoz -- who has an 8-year-old son -- told police that her mother had been driving, but officers determined that the defendant had been behind the wheel, prosecutors said. Ninety minutes after the fatal accident, Munoz's blood-alcohol level was measured at .20 percent, more than twice the legal limit for driving, authorities said. In placing Munoz on five years probation, Superior Court Judge Polly Shamoon told the defendant that she wasn't a "monster" and that she didn't intend the kill her mother. One slip-up on probation and Munoz will be going to prison, the judge told her. "You could have avoided this," Shamoon told the defendant. "You can never get away from what you did." In court Friday morning, Munoz's family asked the judge for leniency. "Our family is torn apart from that day on and there's a piece missing right now -- one is my wife [who] is never coming back no more, " said Mario Villareal Munoz' stepfather. "The other piece that's missing from the family is Paulina; we need her back home." Munoz's wife told the judge her partner needs to come home for their 8-year-old son. "She's my life partner, and my stepson is -- every night -- waiting for her to come back home," said Esadora Guiterrez. Munoz's attorney comforted her as she cried during most of the hearing. A family friend choked back tears talking about the impact on the 8-year-old boy. "The son asks for his mom and I pick him up daily from the Boys and Girls Club. He always asks, about twice a month he will cry himself to sleep. He'll cry himself to sleep because he sees someone who resembles his mom, some rock that they painted together; the following day he is not the same," said friend Christian Medina. Schott respected the judge's decision. "She's going to be living with a lifetime punishment that no court can impose," said Schott. Munoz did not speak at the sentencing, but her attorney said she is devastated. "They don't get any more heartbreaking than this, so I think this was a very fair result," said attorney Cole Casey. "No amount of punishment in terms of incarceration is going to make the pain go away. Setting her free today isn't going to make the pain go away."